PASADENA, Calif. -- The spectacular barred spiral galaxy NGC 6872 has ranked among the biggest stellar systems for decades. Now a team of astronomers from the United States, Chile and Brazil has crowned it the largest known spiral, based on archival data from NASA's Galaxy Evolution Explorer (GALEX) mission, which has since been loaned to the California Institute of Technology in Pasadena. Measuring tip-to-tip across its two outsized spiral arms, NGC 6872 spans more than 522,000 light-years, making it more than five times the size of our Milky Way galaxy. 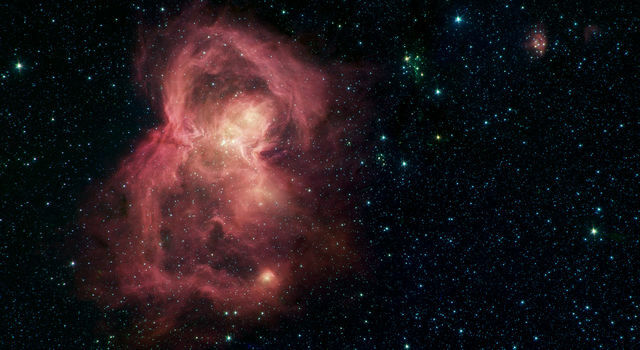 "Without GALEX's ability to detect the ultraviolet light of the youngest, hottest stars, we would never have recognized the full extent of this intriguing system," said lead scientist Rafael Eufrasio, a research assistant at NASA's Goddard Space Flight Center in Greenbelt, Md., who is a doctoral student at Catholic University of America in Washington. He presented the findings Thursday at the American Astronomical Society meeting in Long Beach, Calif. 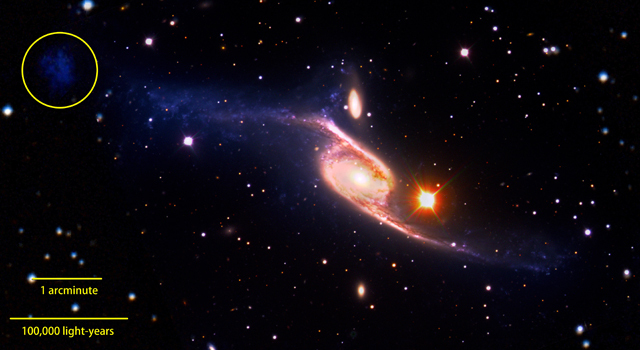 The galaxy's unusual size and appearance stem from its interaction with a much smaller disk galaxy named IC 4970, which has only about one-fifth the mass of NGC 6872. The odd couple is located 212 million light-years from Earth in the southern constellation Pavo. Astronomers think large galaxies, including our own, grew through mergers and acquisitions -- assembling over billions of years by absorbing numerous smaller systems. Intriguingly, the gravitational interaction of NGC 6872 and IC 4970 may have done the opposite, spawning what may develop into a new small galaxy. "The northeastern arm of NGC 6872 is the most disturbed and is rippling with star formation, but at its far end, visible only in the ultraviolet, is an object that appears to be a tidal dwarf galaxy similar to those seen in other interacting systems," said team member Duilia de Mello, a professor of astronomy at Catholic University. 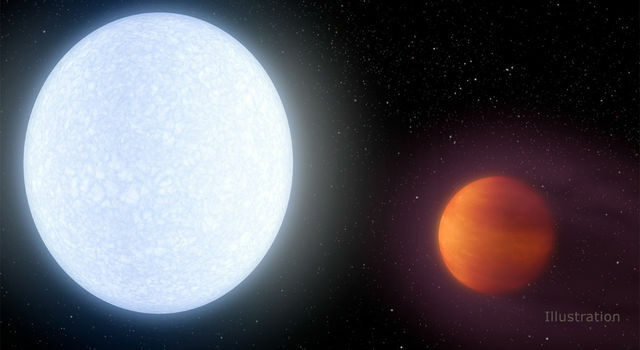 The tidal dwarf candidate is brighter in ultraviolet than other regions of the galaxy, a sign it bears a rich supply of hot young stars less than 200 million years old. The researchers studied the galaxy across the spectrum using archival data from the European Southern Observatory's Very Large Telescope, the Two Micron All Sky Survey, and NASA's Spitzer Space Telescope, as well as GALEX. By analyzing the distribution of energy by wavelength, the team uncovered a distinct pattern of stellar age along the galaxy's two prominent spiral arms. 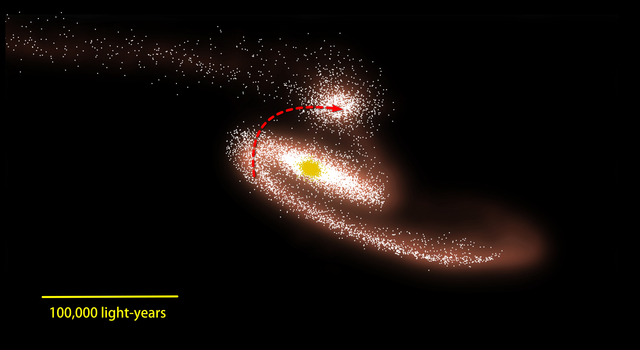 The youngest stars appear in the far end of the northwestern arm, within the tidal dwarf candidate, and stellar ages skew progressively older toward the galaxy's center. The southwestern arm displays the same pattern, which is likely connected to waves of star formation triggered by the galactic encounter. 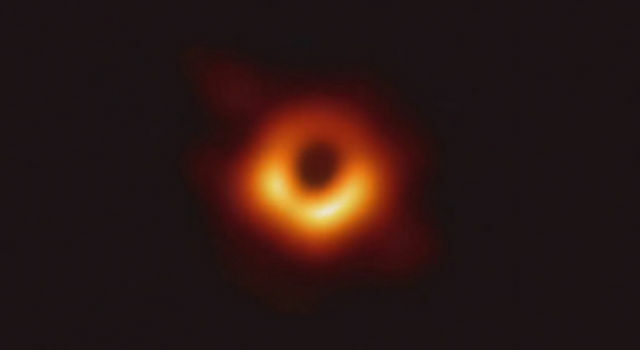 A 2007 study by Cathy Horellou at Onsala Space Observatory in Sweden and Baerbel Koribalski of the Australia National Telescope Facility developed computer simulations of the collision that reproduced the overall appearance of the system as we see it today. 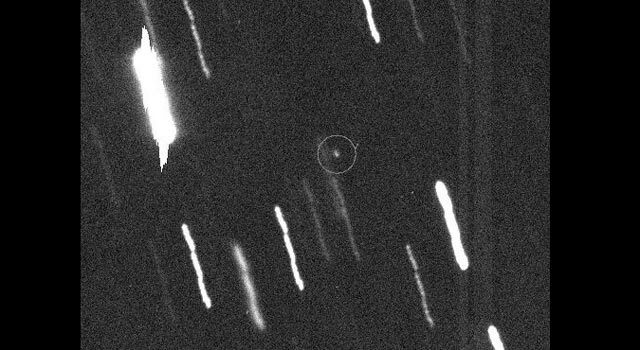 According to the closest match, IC 4970 made its closest approach about 130 million years ago and followed a path that took it nearly along the plane of the spiral's disk in the same direction it rotates. The current study is consistent with this picture. As in all barred spirals, NGC 6872 contains a stellar bar component that transitions between the spiral arms and the galaxy's central regions. Measuring about 26,000 light-years in radius, or about twice the average length found in nearby barred spirals, it is a bar that befits a giant galaxy. The team found no sign of recent star formation along the bar, which indicates it formed at least a few billion years ago. Its aged stars provide a fossil record of the galaxy's stellar population before the encounter with IC 4970 stirred things up. 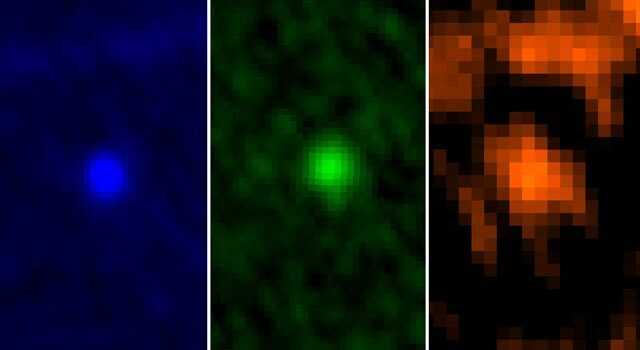 "Understanding the structure and dynamics of nearby interacting systems like this one brings us a step closer to placing these events into their proper cosmological context, paving the way to decoding what we find in younger, more distant systems," said team member and Goddard astrophysicist Eli Dwek. The study also included Fernanda Urrutia-Viscarra and Claudia Mendes de Oliveira at the University of Sao Paulo in Brazil and Dimitri Gadotti at the European Southern Observatory in Santiago, Chile. The GALEX mission is led by the California Institute of Technology in Pasadena, which is responsible for science operations and data analysis. NASA's Jet Propulsion Laboratory, also in Pasadena, manages the mission and built the science instrument. GALEX was developed under NASA's Explorers Program managed by NASA's Goddard Space Flight Center. In May 2012, NASA loaned GALEX to Caltech, which continues spacecraft operations and data management using private funds. For more information about GALEX, visit http://www.nasa.gov/galex and http://www.galex.caltech.edu/ .